PANMUNJOM, South Korea—North Korea violated an armistice agreement with South Korea this month when North Korean soldiers shot and wounded a North Korean soldier as he defected across their border and it must not do so again, South Korea’s defense minister said on Monday. The defector, a North Korean soldier identified only by his surname, Oh, was critically wounded but has been recovering in hospital in South Korea. The incident comes at a time of heightened tension between North Korea and the international community over its nuclear weapons program, but the North has not publicly responded to the defection at the sensitive border. 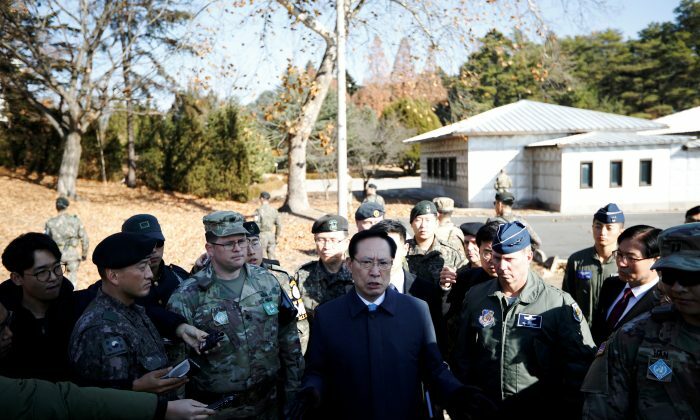 South Korean Minister of Defence Song Young-moo issued his warning to the North while on a visit to the border where he commended South Korean soldiers at a Joint Security Area (JSA), in the so-called Truce Village of Panmunjom, in the demilitarized zone, for rescuing the defector. A North Korean border guard briefly crossed the border with the South in the chase for the defector on Nov. 13—a video released by the U.N. Command (UNC) in Seoul showed – a violation of the ceasefire accord between North and South at the end of the 1950-53 Korean War. “Shooting towards the South at a defecting person, that’s a violation of the armistice agreement,” Song said. “Crossing the military demarcation line, a violation. Carrying automatic rifles (in the JSA), another violation,” he added as he stood near where South Korean soldiers had found Oh, collapsed and bleeding from his wounds. 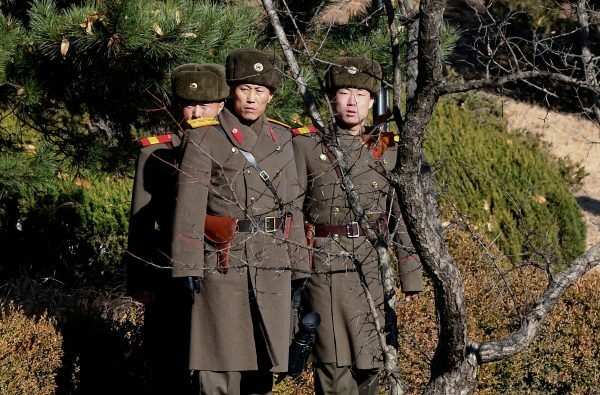 Since the defection, North Korea has reportedly replaced guards stationed there. Soldiers have fortified a section of the area seen aimed at blocking any more defections by digging a trench and planting trees. As Song was speaking 10 meters away from the trees North Korean soldiers planted, four North Korean soldiers were spotted listening closely. 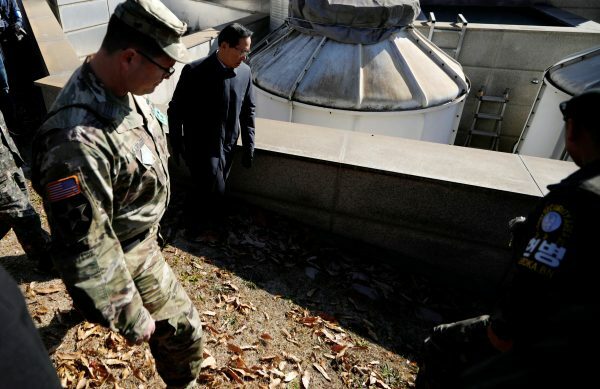 South Korean military officials pointed out two bullet holes in a metal wall on a South Korean building, from North Korean shots fired at Oh as he ran. Oh has undergone several operations in hospital to remove bullets. His lead surgeon, Lee Cook-jong, told Reuters his patient has suffers from nightmares about being returned to the North. In South Korea, six soldiers, three South Korean and three American, were given awards by the U.S. Forces Korea last week in recognition for their efforts in rescuing the defector. After inspecting the site on Monday, Song met troops stationed there for lunch and praised them for acting ‘promptly and appropriately’. 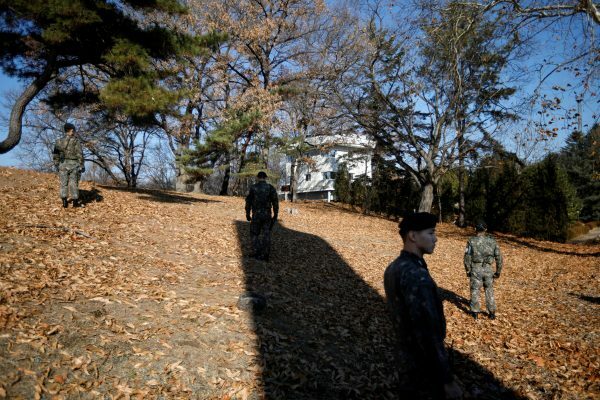 South Korea has been broadcasting news of the soldier’s defection towards North Korea via loudspeakers, according to the South’s Yonhap news agency. South Korean military officials have declined to confirm that.